Mindfulness is a huge international trend. The phenomenon crosses cultures enabling mindful individuals to cross cultures more successfully too. Mindfulness is intercultural. It is a fusion of Eastern ideas and Western aspirations. Mindfulness mixes aspects of Buddhism with Western preoccupations, such as purposefulness, the need for methodologies, the desire for stress reduction. For intercultural trainers and global mobility professionals, mindfulness naturally gives us a fresh and practical perspective in our work. When we use our understanding of culture to make intercultural strategies we very often target awareness, acceptance and stress-reduction or anxiety especially among expatriates. Mindfulness can help us achieve these goals. Through awareness of body and breathing, mindfulness is a monitor of cultural difference. In traditional intercultural training we teach people to recognise their blind spots, to see the cultural iceberg below the surface. Sometimes we might ask people to consider the inventor of the ocean (“we don’t know who it was, but we are pretty sure it wasn’t a fish”). These metaphors for awareness are conceptual and intellectual. Mindfulness heightens awareness without metaphor. Mindful can happen at a very physical level. Through awareness of body and breathing, by reflecting on physical and emotional reactions, mindfulness is itself a monitor of the friction caused by cultural difference. When a traveller, expatriate or culturally-isolated person experiences excitement, frustration or anger, the feeling may be an indicator of cultural differences and unfamiliar situations. Monitoring feelings can alert us to cultural differences. In fact, Mindfulness gives us deep insight into what cultural difference means at a person-to-person level. To manage cultural differences successfully, the mindful perspective suggests we must first dissolve the mindlessness which leads us into harmful automatic and reflexive reactions when we meet other cultures. When we achieve awareness of our own physical reactions we get an individual map of where our cultural boundaries bump up against other cultures. From a mindfulness point of view, the key idea for culture is that thoughts and emotions are transient. They come and go. They do not define you as a person and they do not fix the behaviour of an entire nation over time. Cultures are made of thoughts and emotions, translated into habits and actions, which are also transient. When you realise that your culture is transient, it is easier to release yourself from your cultural framework. It is easier to recognise your own cultural iceberg, the above-the-surface behaviours and reactions and the deeper needs which drive them. But if all cultures are made of transient things, does culture lose its meaning? No, we have always known that cultures change, that cultures have fuzzy edges, that cultures seem so solid from a zoomed-out perspective and yet seem to disappear as we zoom in. Seeing culture as a temporary, moving thing, enables us to detach ourselves from it and view it with more objectivity, more awareness, more mindfulness. Mindfulness does not ask us to give up the whole idea of culture. But it says we should look for more cultural categories, more perspectives and recognise that these cultural categories change constantly depending on the situation, all without judgemental evaluation. Encountering cultural difference is rarely a neutral experience. For most people, it’s stressful. In the media, business and public life the dominant conversation says that cultural difference and diversity are positive and to be welcomed. For some people in some situations, that is undoubtedly true. But there are strong psychological forces behind group-think, driving our desire to be among people who are like us, to be on familiar ground, to reject the unfamiliar. For most people, most of the time, cultural differences make us stressed. Mindfulness has something to offer here. With a mindfulness perspective, you can see the irritation coming, and avoid it using mindful techniques. There are many techniques available for mindfulness. Mindfulness apps such as Insight Timer, practices such as yoga, conscious breathing and stretching all offer moments of mindfulness and a chance for travellers to reflect on cultural difference. In this way, cultural difference can live up to the hype: multiculturalism becomes fun and enriching, not anxiety-forming. Mindfulness lessens your attachment to your own culture, boosts positive perspectives when cultures collide, and enables you to focus on the beauty of the moment. no, you are not required to love the challenge of cultural difference. 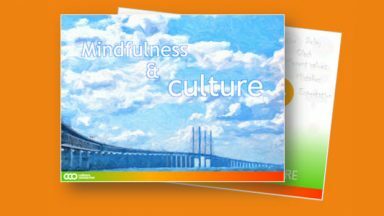 Mindfulness is above all a practice, and it is compatible with many other frameworks, including many of the frameworks we use in the intercultural world. We can apply mindfulness smoothly into cross cultural situations. When facing intercultural situations, mindful intercultural managers do not just toggle between cultures (switching on/off Japanese or Brazilian style). The mindful intercultural manager does not think “now I am being Japanese, now I am being English”. Instead we have to remove the entire concept of self, so that we can pay full attention to the appropriate reactions in the present situation. Instead of automatically following a script, as if we are on autopilot, we should consider our different roles, and the other different roles relevant to the situation (colleague, subordinate, mentor, representative, professional, regional player, networker etc). The situation is always new. Mindlessness means that a certain stimulus always brings the same response. A mindful manager takes new roles and views information from various perspectives. According to mindfulness, it is an illusion to believe that you are a fixed person, and an unchanging self. The mindful intercultural manager has no need to follow one single script for all situations. A mindful intercultural manager acknowledges that his/her own culture is of his/her own choosing and that there is also a choice to detach yourself from your original cultural limitations. When intercultural stress hits, when facing annoyance or frustrations which seem to be caused by foreign cultural practices, a mindful intercultural manager uses breathing exercises to maintain a steady and balanced approach. Increasingly, the mindful intercultural manager can sense these situations approaching, and learns to prevent the stress from ever occurring. So mindfulness has much to say about culture and the way that cultures interact. It is truly a reflection of our intercultural society, and the way that new ideas arise globally through dialogue and cross-fertilisation. As mindfulness changes our ideas about culture, it can also lead us to changes in the way we do intercultural training.